Eighth-grade students at Bullis Charter School presented 3-D architectural designs to a panel of judges Jan. 31 for the nationwide 2014 School of the Future Design Competition. 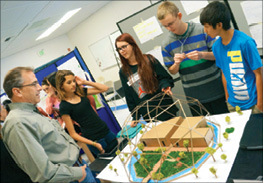 The Council of Educational Facility Planners International, the U.S. Environmental Protection Agency, the American Institute of Architects and more than 20 additional organizations co-sponsor the annual competition, open to middle schoolers. Bullis Charter School students used the Design Thinking process and technologies available in the the school’s FabLab to design environmentally responsive school sites during their Architectural Design and Engineering intersession, part of the core curriculum at the charter school. Roxanne Lanzot, an eighth-grade science and math teacher with a background in architecture, led the project. Lanzot added that students learned a “tremendous amount” about sustainable structures and healthy buildings, which began with data collection and observation at their current school site. Students were tasked with designing a school or classroom that facilitates a high-performance learning environment, incorporates sustainable features, engages the community and is responsive to the environment. The school models included features such as skyways instead of traditional walking paths, green roofs, organic gardens, community facilities (pools, dance studios, technology labs and art rooms), geothermal heating, quartzite walls, solar-panel shades and a geodesic dome structure. The panel of judges included Torrey Wolff, campus space planner at Stanford University, and Suett Wong, interior designer at GoGo Creations. All the student entrants made presentations before the panel selected the design that will continue to the regional round of the competition. Wong said she was “amazed” at the amount of in-depth learning students gained from the project in a short amount of time.